Fred Mac Murray, Dorothy Malone, Walter Brennan, Tommy Rettig, Skip Homeier, John Qualen, Whit Bissell. 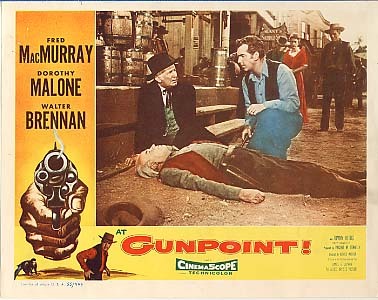 At Gunpoint is a good solid standard western of the 1950s. Fred Mac Murray, after a successful career in the 1930s and 1940s, especially with Double Indemnity, moved to more genial roles in the late 40s. However, during the 50s he was in a mixture of films from standard westerns and action adventures to more higher-profile films as Woman’s World and, especially, The Caine Mutiny. He appeared in The Apartment for Billy Wilder in 1960 and then during the 60s and 70s settled into comfortable grandfatherly roles for Walt Disney. Dorothy Malone was a popular star at the time and won an Oscar the following year for Written on the Wind. Walter Brennan had been around for many decades and had won three Oscars for best supporting actor (as was said, one performance, three Oscars). He gives his standard performance here and it is rather a shock to find that he was only sixty when he made the film. Child star Tommy Rettig appeared on Lassie at this time and also in a number of big-budget films including The Egyptian and River of No Return. Skip Homeier was a villain in many a western at this time. It was only three years after High Noon and the plot is somewhat similar. A group come to rob the bank in a very quiet town, Plainville. The store owner luckily shoots one of the robbers in the back and wards off the threat to the town. However, the gang reunite and wreak vengeance on the town, creating fear amongst all the populace so that the storekeeper goes from hero to someone shunned – finally asking him to leave the town. However, he tells the truth to the townspeople and they finally rally to confront the robbers. Fred MacMurray? is standard in the role, a solid Hollywood figure and an upright man. Dorothy Malone is charming as his wife. Tommy Rettig is their son. The film was only brief – but is one of those westerns of the 50s which was made without much fuss and which still stands the test of time. 1.An interesting and entertaining western? The resemblance to the plot of High Noon? The western town, characters, conventions? 2.The picturing of the town, the locations, the store? The saloon? The streets? Familiar western territory? The conventions of the store owner, the saloon (rather sanitised)? The bank robbers? The marshals? The need for law and order? 3.The title, the focus on the Dennis gang before the credits, getting the guns, pointing the guns? The use of guns throughout the film? The robbers – and the shootings during the robbery? The teller attempting to get his gun? Jack Wright and his lucky shot? George Henderson and his shooting the robbers? The use of guns – especially in the killing of Wally? The finale – Jack Wright and the confrontation, Bob Dennis and his gun, his backup? The townspeople all pointing their rifles at the robbers? 4.The character of Jack Wright, the storekeeper, happy marriage, his son, his brother-in-law? Doc and his staying at the store, playing chess with the marshal? The kids happily coming into the store? The popular man? His shooting the Dennis brother in the back? His being feted, at the saloon, the townspeople wanting to elect him marshal? His decline? People gradually being afraid, his friends, going into the saloon and their moving out quickly, the stranger in town and their assumption that he was a killer? The women and the children? His wife, her concern? Bill and his admiration for his father? Worrying about him? Bob Dennis coming during the night, shooting Wally by mistake? Jack Wright and his principles, Martha taunting him? His wanting to send them away? His pride, going to the meeting, confronting the townspeople, speaking the blunt truth to them about the town, their cowardice? His being supported at the end? His getting the reward from the bank? 5.Martha, dutiful wife, mother, with Billy, her work? Friendly with Doc? The place of women in the town – subsidiary? The glimpse of the children, playing together, coming into the store for sweets? 6.Doc, Walter Brennan’s genial performance? The conscience of the town? His standing alone, supporting Jack? Shooting Bob Dennis? 7.Livingstone, at the bank, the robbery, the death of the teller, his gratitude, getting the money back, leadership in the town, the drinks and the election of the marshal, the reaction to the death of the new marshal? His being the spokesperson for the men and their fears? The other characters in the town, Al Ferguson, Clem Clark? At home with their wives? 8.The Dennis gang, Alvin Dennis and his leadership, his death? Bob, vengeance, the other members of the group, support? Bob and his shooting Wally? His coming into the town, his death? 9.The marshal, law and order – and his going back to Amarillo? The townspeople and their fears? An authentic aspect of the need for law and order in the American west?